Elite Whey Protein - Is It an Effective Protein Powder? Manufacturers say that Elite Whey Protein is a low-cost, low-carb protein supplement that is perfect for carb watchers! These are definite selling points for Elite Whey Protein, but effectiveness and quality should also be high on your list of things to look for. Let’s see how Elite Whey Protein stacks up against a high-quality product like Myotein. Will Elite Whey Protein be a good choice for you? With Elite Whey Protein, you get 24 grams of protein in every serving (1 scoop). Most protein powders I’ve seen, including Myotein, stick pretty close to this amount because it’s 48% of your Daily Value of protein. Sure, you could take more; but since the body can only handle so much protein, it may not be better. The protein in Elite Whey Protein is whey protein isolates (the purest form of protein), whey protein concentrate, and whey peptides. These are all fast-absorbing of protein, which means it’s best to use them in the morning or right before a workout. They deliver nutrients and energy quickly. 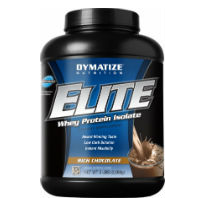 Elite Whey Protein has a 40 mg proprietary blend of Zytrix®, Protease, Lactase, and Lipase. These ingredients are supposed to enhance your body’s ability to absorb protein quickly. This way, your body should get more benefits from the protein and you should feel the effects sooner. These types of ingredients are good to have in a protein powder. Another popular one I’ve seen is Aminogen®, which you can find in Myotein and Optimum 100% Casein Protein. Does Elite Whey Protein Have BCAAs? Some sites I came across claim that Elite Whey Protein has branched-chained amino acids in its formula. It does not. These sites are most likely referring to All-Natural Elite Whey Protein–which does have BCAAs–under the wrong name. Three of the most popular flavors seem to be Café Mocha, Chocolate Fudge, and Chocolate Mint. The supplement facts shown here are for the Rich Chocolate flavor, but they stay the same (with only slight variations) for the other flavors. If you want to read what users say, go to Bodybuilding.com. This site has more than 580 customer reviews of Elite Whey Protein. On average, users give Elite Whey Protein a rating of 8.6 out of 10. This is a great rating. I’ve only seen a few other protein powders, like Myotein and Gold Standard Whey Protein, get higher ratings. Since Elite Whey Protein has a good dose of protein–not too large, not to small–it shouldn’t cause side effects like upset stomach and bloating. These problems are usually cause by protein powders with too much protein, because your body can’t use it, so it gets wasted. 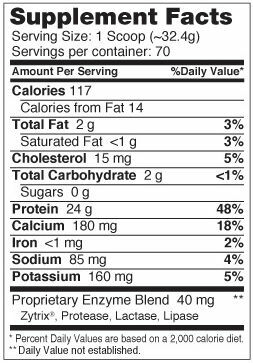 If you want to get 100% of your Daily Value of protein, I recommend taking 2 scoops of Elite Whey Protein a day, but take them at two different times. For instance, you could take one scoop first thing in the morning and another in the early afternoon or before your workout. Elite Whey Protein comes in containers of 2 lbs. or 5 lbs. When you buy it from the official website, the 2 lb. container costs $41.59 and the 5 lb. container costs $86.59. These aren’t the “low-costs” promised by the manufacturer, but they are typical costs for high-quality protein powders. For example, a 2.55 lb. container of Myotein costs $59.95. Then again, Myotein is the #1 protein powder for quality this year. You can get Elite Whey Protein for less when you buy it from other sites, but make sure to look at your purchase carefully. Several sites confuse Elite Whey Protein with All-Natural Elite Whey Protein and they’re not the same product. Bodybuilding.com and GNC are two other retailers that sell Elite Whey Protein. The lowest prices I could find are $23.99 for 2 lbs. and $44.99 for 5 lbs. Neither these sites nor the official site offer a money back guarantee. Elite Whey Protein has three good sources of protein. I like the dose it uses because it’s a good amount that your body should be able to utilize. I also like the enzyme blend, which has been added to speed up and promote absorption. The downsides to Elite Whey Protein are that it doesn’t come with a money back guarantee and it doesn’t give you as much for your money as some products do. Whereas Elite Whey Protein has 3 types of protein, Myotein–for about the same price–has 6 of the highest quality proteins available. And Myotein comes fully guaranteed for 90 days. I think Elite Whey Protein is a good protein powder. But if you want one of the best protein powders, I suggest looking at Myotein. If you’ve tried Elite Whey Protein, I would like to hear your opinion. Is it a good product? Would you recommend it? I was introduced to dymatize xt by my instructor, because i used to get the munchies in the middle of the night, after working out.It’s slow release stopped the munchies and I don’t experience hunger till the next morning.I have gained more muscle and the taste is not bad at all.However, there is a certain amount of water weight gain since using this protein, but it is not at all a terrible product. i want elite price and suggest me how to use…….and also is there any side effect may occur in future. i have good quality pritoen shakes, but for some reason i don’t like the way i feel after i drink it after a work out.. But for now i’ll just have enough carbs and pritoen in my diet to create calorie deficit. According to Steve Turano, He has You tube vids under Body performance, If u have a calorie deficit and do exercises that involve intense muscle contraction, u will still get big.. I’m testing his theory out on video. Do you think this is possible? Aw, ce fut une très agréable après. Dans idée que je voudrais mettre par écrit comme ça en plus – en prenant le temps et l’effort réel pour faire un très bon article … mais que puis-je dire … Je tergiverser beaucoup et en aucun cas l’impression de faire quelque chose.